IT APPEARS LIKELY that diesel and petrol prices will continue to fall as consumers benefit from lower oil prices and an extremely competitive market. 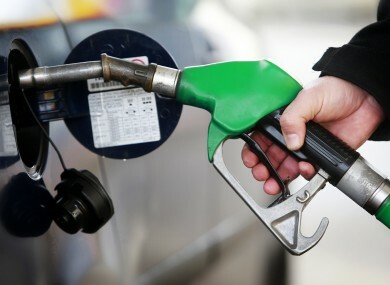 Average petrol prices stand at 126.5 cent per litre and diesel at 112.8 per litre according to the most recent survey by the AA conducted earlier this month. And according to the motoring association’s director of consumer affairs Conor Faughnan, further falls are coming through, “but they are coming through a little slowly”. “We’re very often asked ‘Do retailers faithfully pass price reductions on?’, and we’ve looked for this as a pattern across the country,” Faughnan told RTÉ’s Morning Ireland. Overall, despite what bar stool conspiracists want to believe it tends to be true that price gets passed on, overall, on average. Brian Tuffy, who owns Tuffy’s Gala filling station in Ballina, county Mayo, is selling diesel for 99 cent per litre and appears to have the lowest diesel price in the country. Speaking to RTÉ’s Seán O’Rourke earlier, he said the west and northwest of Ireland have always been very competitive. We could see the price of fuel falling over the last week or so. Rather than bring it down piecemeal and bit by bit we decided to reduce the price to give our customers value for money, particularly in January after the Christmas. Pierce Kavanagh’s service station in Urlingford, Kilkenny, is now boasting the cheapest petrol in the country at 119.9 cent per litre. Owner John Kavanagh told the radio show that right now he is trying to sell it to customers “as cheap as possible, as we can, just to make enough out of it”. We have, in our vicinity, in the 5km radius, we have four filling stations so we have to be competitive. Like Tuffy, he relies on the business that the petrol sales bring into the store attached to the station. Both men said they found customers were shopping around and were favouring their stations for their lower prices, even if it only came down to a few cents. The reason why our prices are not falling as much as we’d like to them to istax. He explained that “austerity-era supertaxes” introduced following the 2008 emergency budget still linger. Email “Price war means motorists set to save on petrol and diesel”. Feedback on “Price war means motorists set to save on petrol and diesel”.